Cute and Funny Pug-themed cases/covers for Apple iPhone 5 in a variety of styles. *These designs are also available for iPhone 6 and Galaxy phones - select "form factor" button before checkout to select your phone model. Sophisticated lady with cute pug, painted by artist Maryline Cazenave.. Your choice of "Barely There" flexible cover or "Vibe" hard shell case with shock absorbing liner. 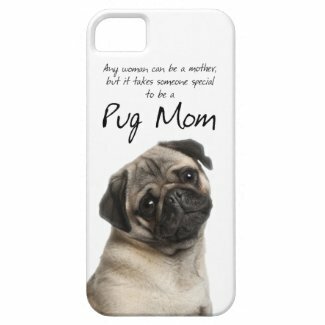 "Any woman can be a mother, but it takes someone special to be a pug mom". Your choice of "Barely There" flexible cover or "Vibe" hard shell case with shock absorbing liner. Cute colorful unique pug themed smartphone cases, skins and laptop bags. Your choice of "Barely There" flexible cover or "Vibe" hard shell case with shock absorbing liner. This cute 3D pug shaped silicone case will protect your iPhone 5 from scratches and dust. A fashionable treat exclusively from The Bradford Exchange, this all-in-one cell phone wristlet can also be used as a mini purse. It is expertly crafted of rich chocolate brown quilted fabric with a contrasting teal blue paisley pattern and paw prints. The tabbed front pocket keeps your cell phone handy and safe, while the zippered interior compartment holds your credit cards and ID. The detachable wrist strap boasts a lobster clasp and a gleaming golden metal charm of the pup you love best. Designed for the Apple iPhone 5 (AT&T, Verizon, and Sprint models). Your choice of "Barely There" flexible cover or "Vibe" hard shell case with shock absorbing liner. a vibrant image of a pug in love by the sea. Your choice of "Barely There" flexible cover or "Vibe" hard shell case with shock absorbing liner. Puppy Love is in the air! Celebrate Valentine's Day, or any day, with a lovely rose from this cute Pug puppy. Great gift for yourself, your family and your Valentine who love Pugs. Your choice of "Barely There" flexible cover or "Vibe" hard shell case with shock absorbing liner. Hand drawn illustration by McBooboo. Your choice of "Barely There" flexible cover or "Vibe" hard shell case with shock absorbing liner. An adorable pug poses for the camera... what a cutie! Your choice of "Barely There" flexible cover or "Vibe" hard shell case with shock absorbing liner. Show the World that YOU are a PROUD Pug Dog Owner! This DIVA design is embellished with a dog collar and Pink Paw Prints. Choose "form factor" before checkout to select your phone model. 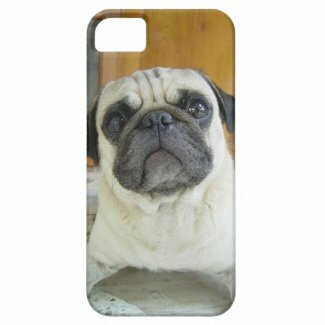 MANY MORE like this at Pug iPhone Accessories at Zazzle (iPhone 4 and 6 covers also).